The 1990s saw a growing demand in Thailand for communities to be included in decisions about the management of cultural and natural resources, culminating in the 1997 Constitution in which some of these rights were formalized. Recognizing that the implementation and engagement of these rights at the local level had not been evaluated, Sirindhorn Anthropology Center (SAC) based in Bangkok, Thailand identified the need to research these issues, formulating the Culture and Rights in Thailand Project (CRT) in 2009. 2011 saw the publication of 9 sub-projects which were aimed at finding out how culture and rights were being expressed at the local level. While there was significant topical, geographical and disciplinary variation across the sub-projects, the CRT also identified commonalities. June 2013 sees the final meeting of the Culture and Rights Forum, a monthly meeting of researchers to discuss their understandings of culture and rights in Thailand. Many of the experiences revealed in the research have resonance with the debates on-going in the Philippines, as the government is taking steps to legislate cultural rights into public policy. As stakeholders in human development, there is a need for us to continually re-examine our assumptions and understandings of the nature of culture and rights in the Philippines. More information about the other research conducted can be found at the CRT website. Alexandra Denes conducted research into the effect of the opening of the Prasat Hin Phanom Rung Sanctuary in Buriram Province as a historical park. In efforts to inscribe a scientific and archaeological narrative, depicting the site as part of the nation’s official heritage, a Buddhist Temple and Buddha’s footprint were removed from the sanctuary. Along with the redevelopment of the site for the purposes of national heritage, it also became a major tourist attraction. The effect was the marginalization of the local people and the mixture of animist and Buddhist beliefs and practices which had developed around the site since the collapse of the original Ankor builder’s rule in the 15th Century C.E. Through a series of community consultations, the locations of spirit houses and other mythic and sacred sites that were of significance to the ethnic Khmer, Lao and Thai Korat peoples who live in the area were mapped out, and recommendations were made for the safeguarding of these sites and values. These included integrating the maps into the local school curriculum. The research revealed the challenges which arise around sites which have historical, scientific and archaeological value as part of a national and ‘authorised heritage discourse’ , but in the course of time have also become sacred sites to local communities. When politicians and the tourist industry influence the management of these heritage sites, how can these local, intangible customs and values be protected or co-exist with national ideas of heritage? Cultural Heritage – a Right or a Resource? 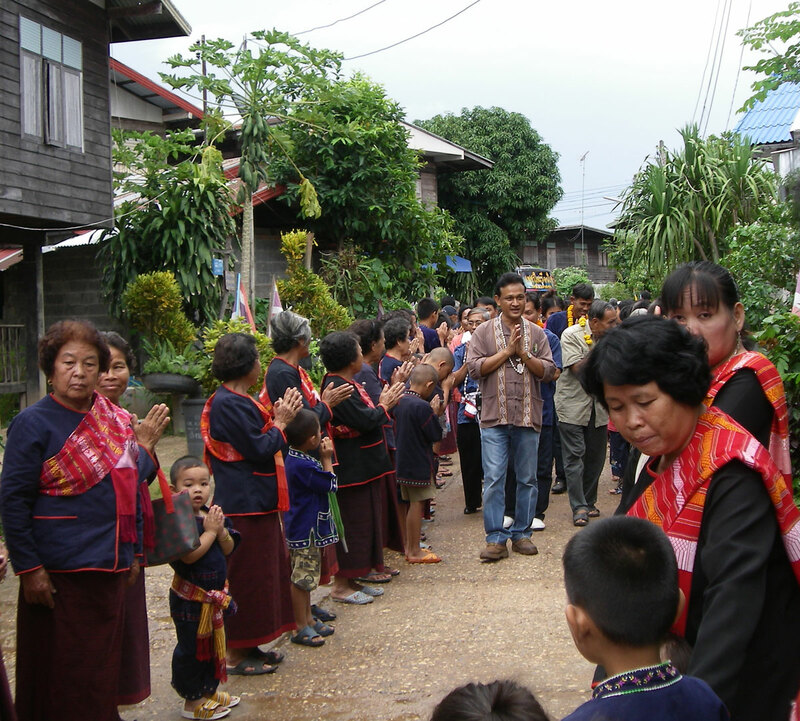 Sirijit Sumanta conducted research into the expression of culture and identity among the Phu Tai ethnic group in the village of Ban Phu, Nong Sung District of Makadaha Province. As an area subject to many development projects throughout the 1960s and 70s, the community identity revolved around a discourse on economic development, rather than any expression of Phu Tai ‘wisdom and identity’1. Increases in visitors from outside of the community through tourism had inspired a revival of some of the tangible and consumable aspects of the culture such as cooking, weaving and dancing, and this has undoubtedly been profitable to the community – with the Ban Phu Homestay Project earning over 1,800,000 Baht in 2007 (approximately 57,840 USD at current rates). The traditional Yao healing practices have already disappeared and there are a few remaining who can read the communities’ ancient Lao Buddhist palm leaf manuscripts. This skill is likely to be lost completely if action is not taken, as the school does not include the language in its curriculum. This research raises questions about how ‘development’ is organized and what it achieves. While tourism has given the community self-sufficiency and promoted local industry and business, this has not affected community consciousness of their cultural rights, and the question remains as to whether the Phu Tai culture – its people’s knowledge of their history, beliefs and spiritual practices – will survive. The Thai Community Forest Act of 2007 has been praised as defending ‘community rights.’ However, the language used highlights the dependence of communities’ rights to land on their ability to manage the forest sustainably. Bencharat Sae Chua’s research highlights the efforts of the community forest movement to redefine their traditions in the light of this environmentalist discourse. The discussions conducted during the research revealed that the residents of protected forest areas were not overtly engaged in forest management, but did depend on the forest for a number of products which supported their livelihood activities, subsistence agriculture and trade. However, in the knowledge that the national policy framework gives preference to the preservation of protected areas for the ‘educational and leisure purposes of the people’1 over community rights ‘to access natural resources as a means of livelihood’1, the community forest movement felt compelled to reconstruct their cultural identity as protectors of the forest, in compliance with this national discourse. 1 SAC Anthropology Newsletter, March 2013. Princess Maha Chakri Sirindhorn Anthropology Center, Bangkok.